Walter Emmons Alston (December 1, 1911 – October 1, 1984), nicknamed "Smokey", was an American baseball player and manager in Major League Baseball (MLB). He is best known for managing the Brooklyn/Los Angeles Dodgers between 1954 and 1976. Alston signed 23 one-year contracts with the Dodgers. He had a calm, reticent demeanor, for which he was sometimes also known as "The Quiet Man". Alston grew up in rural Ohio and lettered in baseball and basketball at Miami University in Ohio. Though his MLB playing career consisted of one game and one at-bat with the St. Louis Cardinals in 1936, he played and managed for several seasons in minor league baseball. His service included a stint as manager of the Nashua Dodgers, the first integrated professional team in modern baseball. He was promoted to manage the Brooklyn Dodgers in 1954 after several successful seasons in Brooklyn's Class AAA minor league teams. As a major league manager, Alston led Dodgers teams to seven National League (NL) pennants and four world championships. His 1955 team was the only World Series championship team while the club was in Brooklyn; they clinched the NL pennant earlier in the calendar year than any previous pennant winner in league history. Alston retired with more than 2,000 career wins and managed NL All-Star teams to seven victories. He was selected as Manager of the Year six times. Alston was elected to the National Baseball Hall of Fame in 1983. He suffered a heart attack that year, was hospitalized for a month and was unable to attend his Hall of Fame induction ceremony. He never fully recovered and he died at a hospital in Oxford, Ohio on October 1, 1984. Alston was born in Venice, Ohio. He spent much of his childhood on a farm in Morning Sun, Ohio. When Alston was a teenager, the family moved to Darrtown, Ohio. He attended Milford Township High School in Darrtown. He received the nickname "Smokey" as a high school pitcher, owing to the speed of his fastball. He graduated from high school in 1929 and married longtime girlfriend Lela Vaughn Alexander the next year. In 1935, Alston graduated with a degree in industrial arts and physical education from Miami University in Oxford, Ohio. He said that finances were a challenge in college and that he had paid his way through school by playing pool. He lettered three years in both basketball and baseball. Alston played minor league baseball as an infielder for the Greenwood Chiefs and Huntington Red Birds in 1935 and 1936, respectively. For the 1936 Huntington team, he hit 35 home runs in 120 games. Alston's only major league game was with the St. Louis Cardinals on September 27, 1936, substituting for Johnny Mize at first base. He later described his major league playing career to a reporter by saying, "Well, I came up to bat for the Cards back in '36, and Lon Warneke struck me out. That's it". He also committed one error in two fielding chances at first base. Alston returned to the minor leagues after his brief MLB appearance. He split the 1937 season between the Houston Buffaloes and Rochester Red Wings, hitting for a combined .229 batting average. Alston played for the Portsmouth Red Birds in 1938, finishing the season with a .311 average and 28 home runs as Portsmouth won its only Middle Atlantic League championship. He returned to Portsmouth in 1940, hit 28 home runs and was a player-manager for part of the season. He was a player-manager for the next two seasons with the Springfield Cardinals and even appeared in seven games as a pitcher in 1942. He returned to Rochester as a first baseman and third baseman in 1943. He moved to the Trenton Packers, where he was a player-manager in 1944 and 1945. Alston had been offered the job in Trenton, a minor league farm club of the Brooklyn Dodgers, by Branch Rickey, the executive who had signed him as a player with St. Louis. After his two seasons with Trenton, Alston served as a player-manager for the first integrated U.S. baseball team based in the twentieth century, the Nashua Dodgers of the Class-B New England League. Alston managed black Dodgers prospects Don Newcombe and Roy Campanella, leading Nashua to a New England League title in 1946. Alston later said that he did not give much consideration to racial issues and that he had simply thought about how much they would benefit the team. Alston led the Pueblo Dodgers to the Western League title the next season. He appeared as a player in two games, which were his final professional playing appearances. For his 13-season minor league playing career, Alston hit .295 with 176 home runs. However, he hit only .239 in 535 at bats in Class AA, which was the highest minor league classification through 1945. In 1948, Alston managed the St. Paul Saints, a Dodgers Class AAA affiliate, to an 86-68 win-loss record. The team finished in third place, 14 games behind an Indianapolis Indians team managed by Al López. That year, Alston managed Campanella again, where Campanella integrated the American Association. The media was critical of Alston for playing Campanella; they said that the catcher was simply there to integrate the league. Campanella hit 13 home runs in 35 games and fans were dismayed when he was called up to the Dodgers. The 1949 Saints finished with a 93-60 record and four of its players collected more than 90 runs batted in (RBI). The team finished in first place, half a game in front of Indianapolis. During the baseball off-season, Alston worked as a teacher in Darrtown. From 1950 to 1953, Alston managed another Dodgers AAA affiliate, the Montreal Royals of the International League. The team won between 86 and 95 games during each season of Alston's tenure. The 1951 and 1952 Montreal Royals won International League pennants. In 1951 and 1953, Montreal won the Governors' Cup playoff tournament. Alston was inducted into the International League Hall of Fame many years later. Alston was named manager of the Brooklyn Dodgers for the 1954 season. His predecessor, Charlie Dressen, had moved on from the Dodgers after the team's leadership refused to sign him to a two-year or three-year contract. Dressen had won two pennants in three years and nearly won a third. Dodgers executive Buzzie Bavasi fought for Alston to be hired in Brooklyn. Bringing Alston to Brooklyn has been described as Bavasi's biggest contribution to the team's history. Alston was an unknown at the major league level and the New York Daily News reported his hiring with the headline "Walter Who?" Becoming immediately known for his quiet nature, Alston was sometimes referred to as "The Quiet Man". Alston's personality contrasted with that of Dressen, who was much more outspoken. Sportswriters had difficulty writing about Alston at first because he did not say much. He also seemed more conservative in his decisions on the field, which drew criticism from his players even though he had managed many of them in the minor leagues. Don Zimmer said that he had learned more from Dressen and that Dressen knew more about baseball than Alston. Jackie Robinson did not like Alston at first either, according to Robinson's wife. Alston commented on his approach, saying, "I never criticized a player for a mistake on the spot. Whenever I got steamed up about something, I always wanted to sleep on it and face the situation with a clear head." Sportswriter Jim Murray said that Alston was "the only guy in the game who could look Billy Graham right in the face without blushing and who would order corn on the cob in a Paris restaurant." The 1954 Dodgers finished second in the NL as both Gil Hodges and Duke Snider hit at least 40 home runs and registered 130 runs batted in. The 1955 Dodgers got off to a strong start. Even so, an Associated Press article noted that Alston was reticent in response to questions and that he did not seem like a manager who had won ten consecutive games. The 1955 Brooklyn team won the pennant and its only World Series championship. They clinched the NL pennant earlier in the year than any team had in NL history. In the World Series, Alston started Johnny Podres, who had a mediocre 9-10 regular season record, in the third and seventh games; Podres won both games. The pitcher had struggled with arm problems for much of the season. Sandy Koufax emerged as a pitcher for the Dodgers during that championship season. Alston was criticized by Jackie Robinson and others over his sparse use of Koufax in his early career. During Koufax's second MLB start, he pitched a shutout, giving up two hits and striking out 14 batters. However, that success did not prompt a lot of opportunities for Koufax. The pitcher appeared in only 12 games that season, mostly in relief. The 1956 team repeated as NL champions; the team was bolstered by the play of Duke Snider, who hit a league-leading 43 home runs and also led the league in walks. They fell to third place (84-70) in 1957. The team finished in seventh place (71-83) in 1958, the club's first season after moving from Brooklyn to Los Angeles. Criticism of Alston had begun to mount during that season, but he led the Dodgers to a world championship in 1959. Six players on the 1959 team finished with double-digit totals in home runs, while 22-year-old Don Drysdale led the team's pitchers with 17 wins. Several Los Angeles players, including Wally Moon, characterized Alston as indecisive in the late 1950s and 1960s. However, Moon later came to describe Alston as a good manager who had gotten "good mileage" out of his players. Managing the NL All-Star Team in 1960, Alston attracted some controversy when he left Milwaukee Braves pitchers Warren Spahn and Lew Burdette off the All-Star roster. An Associated Press report said the omission may have been a snub directed at Dressen, who was by then managing in Milwaukee. The 1960 Dodgers finished in fourth place. The following year, the team finished in second place after veteran Duke Snider missed two months with a broken arm. The Dodgers lost the lead in the 1962 NL pennant race and rumors surfaced that Alston and coach Leo Durocher might be fired, but the team retained both men for 1963. The Dodgers won the 1963 World Series. This series represented the first time that the New York Yankees had lost a World Series in four games. Alston's pitchers excelled, as Koufax struck out 23 batters over two games and Drysdale threw a shutout in Game 3. Over the four games, Alston employed only three starting pitchers and one relief pitcher in the series. In 1964, the team finished 80-82 in its first losing season in several years. Alston used the team's 1964 performance to motivate them moving forward. In spring training before the 1965 season, he said that he would not let his team forget the difficulties they had in the previous season. The Dodgers returned to the 1965 World Series. Alston could not start his number one pitcher, Koufax, in the opening game of that series because Koufax was observing Yom Kippur. Instead, Alston turned to Drysdale, who struggled, lasting 2 2⁄3 innings and surrendering seven runs. When Alston came to the mound to remove him, Drysdale said to his manager, "I bet right now you wish I was Jewish, too." The team recovered from losing that first game and they won the World Series in seven games. Koufax appeared in three games during the series, registering two shutouts. Alston's Dodgers teams of the 1960s benefited from the strong pitching by Drysdale and Koufax. In 1966, both players held out of spring training and demanded three-year contracts each worth $500,000, which was more money than anyone was making in baseball at the time. The players were eventually signed for lesser amounts. Drysdale struggled that year, but Koufax won 27 games. 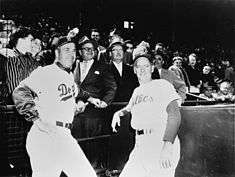 The Dodgers went to the 1966 World Series but were defeated in four games. Koufax retired after the season on the advice of doctors who examined his sore arm. Drysdale retired three years later. Both men had pitched their entire major league careers for Alston. Alston guided his teams to at least 85 wins per season between 1969 and 1976. They finished in second place in their division six times during that span. The team came very close to a pennant in 1971; after falling 11 games out of first place, the team performed well late in the season and finished one game behind the San Francisco Giants. Beginning in 1973, Alston's team featured an infield of Steve Garvey, Davey Lopes, Bill Russell and Ron Cey. The group played together for eight years, remaining together long after the end of Alston's tenure. In 1974, the Dodgers won the NL pennant and went to the World Series to face the Oakland Athletics. Alston used closer Mike Marshall in a record-setting 106 games that season and Marshall won the Cy Young Award. Alston received some media attention when he considered using Marshall as a starter. Marshall ended up appearing in all five games of the series and gave up one run in nine innings, but he did not start a game. The Dodgers lost the series four games to one. The 1975 and 1976 Dodgers won 88 and 92 games respectively, but they finished well out of first place in both seasons. In September 1976, Alston announced that he would retire at the end of the season. At a press conference, Alston said, "I've been in baseball for 41 years and it's been awfully good to me. This has been a pretty big day. I had three birdies playing golf for the first time in my life and now I'm announcing that I'm stepping down as manager. I told Peter this afternoon to give somebody else a chance to manage the club." Alston retired with 2,063 wins (2,040 in the regular season and 23 in the postseason). Alston was named NL Manager of the Year six times. He also managed NL All-Star squads a record nine times and won seven of those games. At a time when multi-year contracts were on the rise, Alston's managerial career consisted of 23 one-year contracts. He earned seven NL pennants in that span. 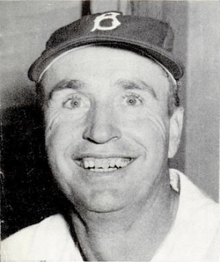 Sportswriter Leonard Koppett described Alston's role with the Dodgers, pointing out that O'Malley was always seen as "the boss" while Alston stuck to the on-field management of the team. Koppett said that Alston's loyalty and subdued nature contributed to the stability that the team enjoyed. O'Malley once commented that Alston was "non-irritating. Do you realize how important it is to have a manager who doesn't irritate you?" The Dodgers retired Alston's number the year after he stepped down as manager; he was only the fourth Dodger to receive that honor. He was elected to the National Baseball Hall of Fame and Museum in 1983. Alston suffered a heart attack that year and was hospitalized for a month. Alston's grandson traveled to Cooperstown to represent the ill former manager at the Hall of Fame induction ceremony. Alston died in an Oxford hospital from complications from the recent heart attack on October 1, 1984. He was 72. A funeral home spokesman said that Alston had remained ill since the heart attack. He is interred at Darrtown Cemetery in Darrtown, Ohio. Upon Alston's death, MLB commissioner Peter Ueberroth referred to him as one of baseball's greatest managers. Former Dodgers great Duke Snider acknowledged occasional run-ins with Alston, but he said that Alston excelled at utilizing the specific strengths of each team that he managed. Tommy Lasorda, who played and coached under Alston and ultimately succeeded him as manager, commented on how easy it was to play for Alston. Broadcaster Vin Scully said, "I always imagined him to be the type who could ride shotgun on a stage through Indian territory. He was all man and two yards tall. He was very quiet, very controlled. He never made excuses. He gave the players the credit and he took the blame. He was so solid, so American." Ohio State Route 177 was named the Walter "Smokey" Alston Memorial Highway in 1999. He was inducted into the International League Hall of Fame in 2010. In April 2013, readers of the Los Angeles Times named Alston number 16 on a list of the 20 greatest Dodgers of all time. A memorial to Alston is located at Milford Township Community Park in Darrtown. ↑ Elderkin, Phil (October 5, 1984). "Walter Alston's 'one-year contract' added up to seven pennants". Christian Science Monitor. Retrieved May 20, 2015. ↑ "Walter Alston Stats". Baseball Almanac. Retrieved November 6, 2012. 1 2 3 4 Johnson, Bill. "SABR Baseball Biography Project: Walter Alston". Society for American Baseball Research. Retrieved August 4, 2013. 1 2 3 4 5 6 "Walter Alston". Society for American Baseball Research. Retrieved August 8, 2014. ↑ "Walter Alston Biography". Baseball Almanac. Retrieved August 5, 2013. 1 2 3 Rogers, Thomas (October 2, 1984). "Walter Alston is dead at 72; Dodgers' manager 23 years". The New York Times. Retrieved August 8, 2014. ↑ Gladstone, Ken (December 12, 1973). "Rich tradition". Ocala Star-Banner. Retrieved January 7, 2015. 1 2 3 4 "Walter Alston Minor League Statistics & History". Baseball-Reference.com. Retrieved April 6, 2014. ↑ "Walter Alston: Fielding". Baseball-Reference.com. Retrieved August 4, 2013. ↑ Graf, Norma (July 25, 2013). "Baseball found a home here in the 1930s". Portsmouth Daily Times. Retrieved May 11, 2015. 1 2 Golenbock, Peter (2010). Bums: An Oral History of the Brooklyn Dodgers. Courier Dover Publications. p. 196. ISBN 0486477355. ↑ Tygiel, Jules (1997). Baseball's Great Experiment: Jackie Robinson and His Legacy. Oxford University Press. p. 148. ISBN 0195106202. ↑ Dickson, Paul (2011). The Dickson Baseball Dictionary. W. W. Norton & Company. ISBN 0393073491. ↑ "1948 American Association". Baseball-Reference.com. Retrieved July 14, 2014. ↑ Tygiel, Jules (January 1997). Baseball's Great Experiment: Jackie Robinson and His Legacy. Oxford University Press. p. 241. ISBN 978-0-19-510620-6. Retrieved May 14, 2015. ↑ "1949 St. Paul Saints". Baseball-Reference.com. Retrieved July 14, 2014. ↑ "1949 American Association". Baseball-Reference.com. Retrieved July 14, 2014. 1 2 3 4 "Walter Alston Dies, Ex-Dodgers Manager". Pittsburgh Post-Gazette. October 2, 1984. Retrieved August 5, 2013. ↑ "Walter Alston Minor League Statistics & History". Baseball-Reference.com. Retrieved July 14, 2014. ↑ "1951 International League". Baseball-Reference.com. Retrieved July 14, 2014. ↑ "1952 International League". Baseball-Reference.com. Retrieved July 14, 2014. ↑ "Hall of Fame Inductee – 2010: Walter Alston" (PDF). Minor League Baseball. Retrieved November 1, 2014. ↑ "Dressen quits Dodgers in contract wrangle". Pittsburgh Post-Gazette. October 15, 1953. Retrieved November 1, 2014. ↑ Sullivan, Neil (1987). The Dodgers Move West. Oxford University Press. p. 58. ISBN 0195363159. Retrieved November 1, 2014. ↑ Snider, Duke; Pepe, Phil (2006). Few and Chosen Dodgers: Defining Dodgers Greatness Across the Eras. Triumph Books. pp. 181–183. ISBN 1572438053. Retrieved November 1, 2014. ↑ McNeil, William (2000). The Dodgers Encyclopedia. Sports Publishing, LLC. p. 125. ISBN 1582613168. ↑ Clavin, Tom; Peary, Danny (2012). Gil Hodges: The Brooklyn Bums, the Miracle Mets, and the Extraordinary Life of a Baseball Legend. Penguin. p. 112. ISBN 1101593059. Retrieved November 1, 2014. ↑ "Wakeup Call". The Morning Call. March 11, 2006. Retrieved April 19, 2014. ↑ "1954 Brooklyn Dodgers". Baseball-Reference.com. Retrieved April 19, 2014. ↑ "Bums' Walt Alston is Still the Quiet Man". Ocala Star-Banner. April 22, 1955. Retrieved August 5, 2013. ↑ "Bums Won't Let up in Play, Says "Unknown" Walt Alston". The Tuscaloosa News. September 9, 1955. Retrieved August 5, 2013. ↑ Miller, Stuart (2006). The 100 Greatest Days in New York Sports. Houghton Mifflin Harcourt. p. 35. ISBN 0-618-57480-8. Retrieved March 21, 2015. ↑ Oliphant, Thomas (April 1, 2007). Praying for Gil Hodges: A Memoir of the 1955 World Series and One Family's Love of the Brooklyn Dodgers. St. Martin's Press. p. 69. ISBN 978-1-4299-0748-4. Retrieved March 21, 2015. ↑ "Sandy Koufax Statistics and History". Baseball-Reference.com. Retrieved March 14, 2015. ↑ Jaffee, Robert David. "Dodgers hit grand slam in history of Jewish players". The Jewish Journal of Greater Los Angeles. Retrieved March 14, 2015. 1 2 3 4 5 Los Angeles Dodgers Team History & Encyclopedia. Baseball-Reference.com. Retrieved April 19, 2014. ↑ "Snider proclaimed 1956 slugging champion". The Virgin Islands Daily News. December 24, 1956. Retrieved January 7, 2015. ↑ Springer, Steve (March 29, 2008). "Command(er) performances". Los Angeles Times. Retrieved November 1, 2014. ↑ "1959 Los Angeles Dodgers". Baseball-Reference.com. Retrieved 7 January 2015. ↑ Mann, Jack. "Dodgers Down-and Up." Sports Illustrated. October 18, 1965. ↑ "Walt Alston Snubs Ace Brave Hurlers". The Spokesman-Review. July 7, 1960. Retrieved October 31, 2013. ↑ Richman, Milton (March 30, 1962). "Will Jinx Hit LA Again?". Milwaukee Sentinel. Retrieved October 31, 2013. ↑ "Walt Alston, Given Approval, Does the Same for Durocher". The Dispatch. October 18, 1962. Retrieved August 4, 2013. ↑ Hoffman, Benjamin (October 17, 2012). "Beware the broom: A history of sweeps of the Yankees". The New York Times. Retrieved February 7, 2015. ↑ "Alston won't let team forget 1964". Beaver County Times. United Press International. March 9, 1965. Retrieved February 11, 2015. 1 2 Merron, Jeff (September 26, 2001). "Green, Koufax and Greenberg -- same dilemma, different decisions". ESPN. Retrieved February 11, 2015. ↑ D'Antonio, Michael (2009). Forever Blue: The True Story of Walter O'Malley, Baseball's Most Controversial Owner, and the Dodgers of Brooklyn and Los Angeles. Riverhead Books. pp. 301–302. ISBN 978-1-59448-856-6. Retrieved February 7, 2015. ↑ "Don Drysdale". Baseball-Reference.com. Retrieved February 7, 2015. ↑ Langill, Mark (September 3, 2008). "Koufax, Drysdale were a dynamic duo". MLB.com. Retrieved November 1, 2014. ↑ Klein, Gary (June 23, 2013). "Dodgers' infield of the 1970s had a lasting impact". Los Angeles Times. Retrieved November 1, 2014. ↑ "Mike Marshall Statistics and History". Baseball-Reference.com. Retrieved November 1, 2014. ↑ Talley, Rick (October 16, 1974). "Alston mulls using Marshall as a starter". Chicago Tribune. Retrieved November 1, 2014. ↑ "1974 World Series". Baseball-Reference.com. Retrieved November 1, 2014. 1 2 "Veteran Dodger Manager Walter Alston to Retire". The Montreal Gazette. September 28, 1976. Retrieved August 4, 2013. ↑ "Walt Alston to Step Down". The Telegraph. September 28, 1976. Retrieved August 5, 2013. ↑ Davies, Richard (2010). Rivals! : The Ten Greatest American Sports Rivalries of the 20th Century. John Wiley & Sons. p. 46. ISBN 1444320815. Retrieved January 7, 2015. ↑ "Baseball today". The Dispatch. July 11, 1989. Retrieved January 7, 2015. ↑ Koppett, Leonard (January 1, 2000). The Man in the Dugout: Baseball's Top Managers and how They Got that Way. Temple University Press. p. 177. ISBN 978-1-56639-745-2. Retrieved April 5, 2015. ↑ "Alston's No. 24 to be retired by LA". The Tuscaloosa News. June 5, 1977. Retrieved October 31, 2013. ↑ "Alston, Walter". National Baseball Hall of Fame and Museum. Retrieved November 6, 2012. ↑ Corcoran, Dennis (2010). Induction Day at Cooperstown: A History of the Baseball Hall of Fame Ceremony. McFarland. p. 141. ISBN 0786444169. ↑ "Sports World "Blue" Over Alston Death". The Vindicator. October 2, 1984. Retrieved August 5, 2013. ↑ Garcia, Dan (October 2, 1984). "Walter Alston Dies". The Madison Courier. Retrieved August 5, 2013. 1 2 "Walter Alston Dead at 72". The StarPhoenix. October 2, 1984. Retrieved August 5, 2013. ↑ "Alston Dies; Won 4 Series". The Milwaukee Journal. October 2, 1984. Retrieved August 5, 2013. ↑ "Ohio Laws and Rules: 5533.39 Walter Smokey Alston Memorial Highway". LAWriter. Retrieved August 5, 2013. ↑ "Class of 2010" (PDF). MiLB.com. Retrieved November 26, 2014. ↑ Mitchell, Houston (April 26, 2013). "The 20 Greatest Dodgers of All Time, No. 16: Walter Alston". Los Angeles Times. Retrieved August 4, 2013. ↑ Ratterman, Bob (August 14, 2013). "Darrtown gears up for bicentennial with pavers, big plans". The Oxford Press. Retrieved October 31, 2013. Alston, Walter Emmons and Si Burick. Alston and the Dodgers. Doubleday. 1966. Wikimedia Commons has media related to Walter Alston.